...on journalism, new media, and other stuff. Historians, rejoice -- today's Deseret Morning News reports the University of Utah's Digital Newspaper project has nearly completed posting all editions of the Deseret News and the Salt Lake Tribune. 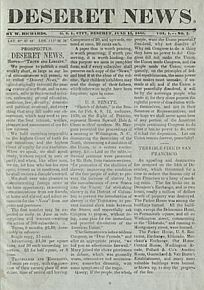 You can get them online at: digitalnewspapers.org. Interesting to have access to an old Australian newspaper online. Honey, they ruined the Treo! The opinions stated here are my own and in no way reflect those of Brigham Young University, its students, faculty, or sponsoring institution.